Mommy Lessons 101: Free Chick-Fil-A Sandwich! Make your reservation for an EXCLUSIVE premiere tasting of the Spicy Chicken Sandwich. 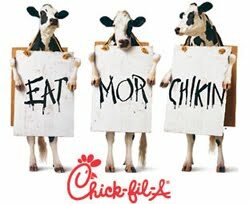 From May 31 to June 5, Chick-fil-A is giving a limited number of FREE Spicy Chicken Sandwiches to customers who make a reservation. It will not be added to the menu until June 7. Just go to the website, here and sign up. Took me a minute or so. And enjoy!